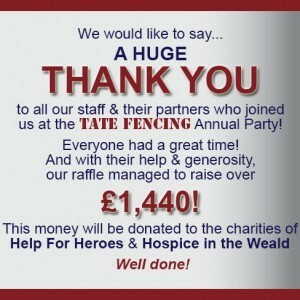 You are here: Home / Latest News / News / Tate Fencing Annual Party Raffle raises over £1,440 for charity! Many, many thanks to the staff and their partners for attending the Tate Fencing annual party on Saturday night. A great time was had by all and with their help, and massive generosity, the raffle managed to raise over £1,440 which will be donated to the charities of Help for Heroes and Hospice in the Weald.